XRP community is celebrating the increased adoption of XRP. With Weiss Crypto Agency ranked XRP grad A, XRP is getting mainstream attention from players like Huobi, Bitfi, and Bitrue exchange. At the time of writing, XRP is up with 3.12% within a couple of hours. The value of XRP finally crossed $.0.30 and gained a miner growth to trade at the value $0.031 against US Dollar. Moreover, as the third largest cryptocurrency, the average trading volume of XRP counts as $12,951,784,024. Announced on March 25, 2019, Bitfi cryptocurrency wallet is launching XRP as a result of increased support and demand from XRP community. As soon as Bitfi released the announcement of listing the third largest crypto, masses showed positive reviews and responses towards Bitfit’s official Twitter account. Accordingly, Bifti stated ‘Wow!, What an outpouring of support and excitement’. According to the latest report, Bitrue Global Digital Asset Exchange is supporting XRP in four different trading pairs. After the quick bullish view of Bitfi supporting XRP, Bitrue exchange announced new XRP trading pairs which are available for trading – those are, ZIL/XRP, IOST/XRP, GNT/XRP, and ICX/XRP. Consequent to the announcement, XRP is now the base currency for Zilliqa (ZIL), IOST (IOST), Golem (GNT) and ICON (ICX) cryptocurrencies. [New XRP Pairs] Just went live @BitrueOfficial ! More to come, happy trading. The inclusion of XRP new trading pairs comes in a wake of Bitrue’s weekly airdrop which will end on March 31, UTC+*. #1 week of $XRP airdrop @BitrueOfficial! Snapshot will be taken at 24:00 on Sunday, March 31, UTC+8. Moreover, In the last week alone, Bitrue hit the various announcement of adding multiple XRP trading pairs. Consequently, on March, Bitrue exchange revealed that they are having 34 XRP pairs in total wherein the coins that latest to join the party includes DASH, BAT and STORM. 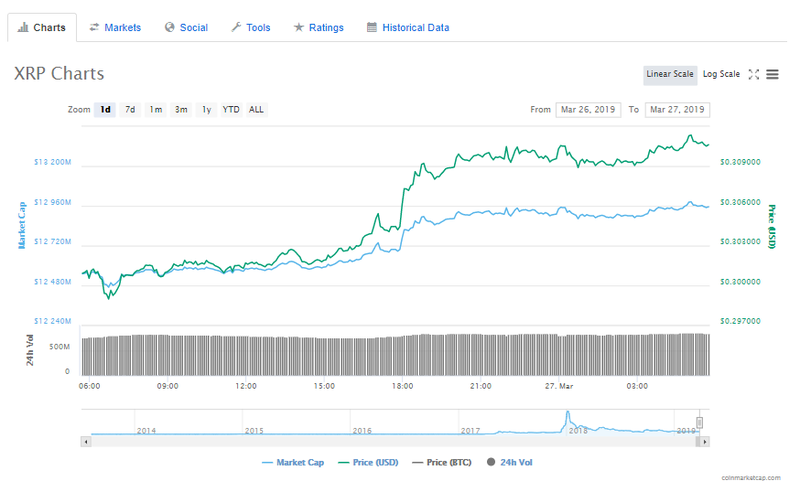 The post XRP Gains New Value with Mainstream Attention from Market Players appeared first on Latest Ripple (XRP) News & Price Analysis.